On Tuesday, WMATA held a public hearing to discuss changes to the Metrobus Q2 line between Silver Spring and Shady Grove. Kathy Jentz, East Silver Spring resident and frequent Q2 customer, testified at the meeting. In this guest blog, she argues that the reconfigured line will reduce service in the Downcounty, where ridership is the highest. Tuesday night was a hearing at First Baptist Church in Wheaton to explain how WMATA is "breaking" the Q2 into two segments starting late this December and to get the public's feedback. "Breaking" being the operative word, as the proposed "improvements" will do nothing to alleviate the current line problems but could do much to worsen it. Unfortunately, only two bus riders including myself testified at the hearing. We were outnumbered ten-to-one by WMATA staff and other area transit employees. If you would like to comment (and I very much urge you to do so), you may send an email by 5pm Friday, October 16 to WMATA's public outreach contact. The Q2 currently runs twelve miles from Shady Grove to Silver Spring, passing through Wheaton and Rockville along Georgia Avenue, Veirs Mill Road, and Rockville Pike. It carries 10,200 riders a day and is one of the most heavily used bus lines in the region. 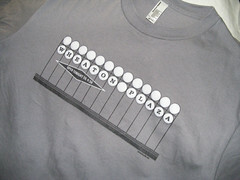 The segment between Silver Spring to Wheaton carries over 50% of those Q2 riders. In the new proposal, there will be a Q2A bus that runs from Shady Grove to Wheaton and a Q2B bus from Rockville to Silver Spring, allowing the Veirs Mill section between Wheaton and Rockville to be served most frequently. One of the problems many Q2 riders pointed out at previous meetings was the detour into the Rockville campus of Montgomery College, which was often totally unnecessary when the campus is closed. That remains as part of the QA route with a minor adjustment to switch campus entrances that will save mere seconds off the bus route. They are also looking into saving time at Shady Grove, Rockville, and Wheaton metro stations by reconfiguring how the buses enter and exit them. I'd suggest they more clearly mark which buses are going in which direction as most delays I experience are the bus drivers repeatedly telling illiterate riders "Shady Grove" or "Silver Spring" as they block others from boarding. I can only imagine how this will play out on the overlapping Q2A/Q2B lines along Veirs Mill with the poor driver having to explain to folks not only the destination but if they are not going all the way as well. 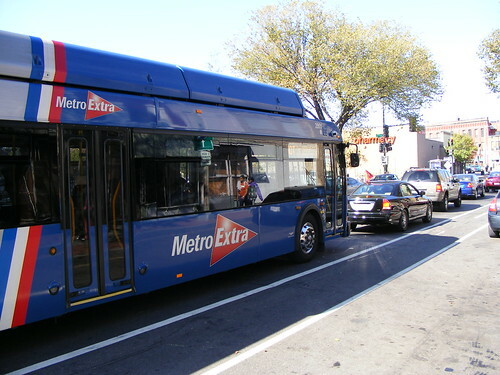 WMATA officials say express service along the Q2 route, like this MetroExtra bus on Georgia Avenue in the District, has been postponed indefinitely. A Q9 Express version of the Q2 line was requested by many of the attendees at past Q2 meetings as the logical solution to the current bus-bunching and schedule problems. I was informed by WMATA & Ride-On staff after the meeting that the Express line "just missed funding" in the current budget by a tiny margain and has been shelved for now. Just as well, as it only went from Shady Grove to Wheaton, inexplicably leaving off the most traveled section of the Q2 line from the Wheaton to Silver Spring stations. When I asked why the Express was not including this segment, I was given no explanation or reason. One official later said that "we hoped this would steer more folks to take the Red line" for that portion. He was not joking. So those of us who want to get upcounty from downcounty are not only forced to transfer between multiple buses, but also between Metro and back and to also then to pay the 3-5x price increase for using rail for a portion of our travels. No mention at all was made of the Y line buses that run north-south on Georgia Avenue and whether they will be increased to absorb this excess passenger load shifted to them by the planned decrease in Q2 service from Silver Spring to Wheaton. When I brought this up in my testimony the officials present looked surprised. The fact is when a Y bus runs late (which is often), the Q2 takes on all those extra passengers and then the bottleneck shifts to the Q2. This is the domino effect that is choking both bus lines. 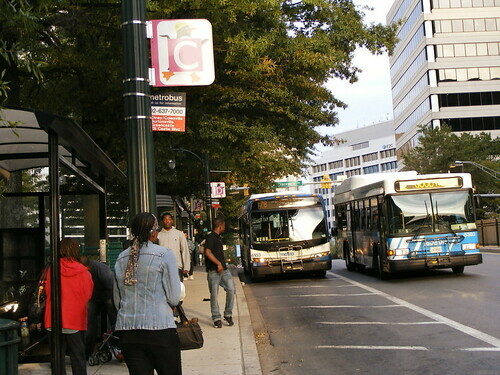 A Georgia Avenue express bus on the Y line, say from Silver Spring to Glenmont, would greatly relieve that pressure on both lines now and would be the ideal solution to most of all of the Q2 bus bunching as well as the Y bus schedule problems. Kathy Jentz is editor and publisher of Washington Gardener magazine and can be reached at WGardenermag at aol dot com. If you've got something to say about East County, say it here! Send any contributions to justupthepike at gmail dot com. 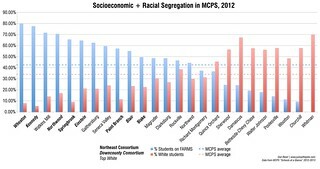 Reading this guest blog -- and a fine one it is -- I am struck by the fact that despite the County and Planning Board intentions to force all residents into using mass-transit, the mass-transit users seem to feel that the transit system is approaching the level of being "broken" with the transit-service operators expressing every intention to break it further. The Gazette editorial for the week -- linked to above -- expresses very serious concerns that there is far too little foresight being given to the consequences of locking ourselves into an exclusively transit-oriented development model. The editorial cartoon says it all: it represents the Planning Board as saying 'these roads will never be fixed' and 'we'll discourage commuters so much to force them into using mass-transit'. Now, it seems that they're going even farther: they're going to break mass-transit on top of leaving roads deteriating and choked. Then the Gazette editorial cartoonist can further mock "your government on drugs" -- as it rightly should -- for discouraging both commuters and transit-riders 'to force them into walking everywhere'. What then? How could they disappoint people even more? I know! They can tear up all of the sidewalks as well as breaking bus-routes and leaving private-vehicle commuting impassible, discourage everyone into telecommuting, and the break the InterNet so people can't even telecommute. Except of course for the ones who planned this. Seriously, follow the logic and that's where it ends. This is all I gotta say. If any of the Gazette editors were young enough to have bought (or be thinking about buying) a home or apartment in the county within the past twenty years, they'd recognize that the American dream hasn't been affordable here in a while, nor will it continue to be. Why shouldn't we provide housing for those who can't afford, don't need or don't want a single-family house? These aren't just new people coming into the county - they're people who already live here and are currently screwed by policies that limit their options in favor of single-family homes. The only coercion that exists now is that which says I have to get in my car and drive to work for lack of other choices, and I hope that more transit options - like an express Q2 line - will provide them for me. Dan, if you will read the Gazette editorial, you will see that even Marc Elrich calls all of this excessive focus on "transit-centric high-density" housing as being a "slap in the face" to the people who already live here, mostly because if you throw all available resources at that one thing to the exclusion of infrastructure maintenance and upgrades, the existing residents of the County get to watch everything fall apart or just get worse, while newcomers get new-and-shiny. You can have up to 7 unrelated persons living in a single-family detached home zoned R-90 or R-60, which covers all of the homes in Aspen Hill, for example. Lots and lots of people downtown -- especially brand-new yuppies fresh out of school such as yourself -- live in such group houses, and they are not necessarily just another college dorm environment. I have been in some rather nice ones and have lived in ones that could have been nicer than they were. The thing is getting the right mix of people. For $1800/month or so, six people could live pretty well, have a yard for parties and BBQ, have pretty significant amounts of privacy, etc. And with something close to 100 in Aspen Hill alone -- and many more such nearby -- foreclosed or unsellable due to the economy, unless you absolutely insist on having a front door to which you only have the key, there's just no real point in building a lot of new rental. So, in a way, this all boils down to investors gambling that there are enough people who want in a future market to have their own totally private space, versus those who might be happy right now in a group house situation in a market flooded with excellent candidate dwellings -- many on or near major bus lines and close to Metrostations. I've made this argument before, and the one respondent suggested that because of their age and "what they've become accustomed to" that they weren't interested in group-house type situations. But the opinion of one person can't be the preferences of all people. Indeed, I would argue that for a lot of people, more group house situations might do a lot to help social and business networking and ameliorate the social isolation that seems to be an increasing strain, especially on younger folks in the professions.